Join the Classic Radio Club. Enjoy the Greatest Shows of All Time! Carl Amari will hand select your classic radio shows from the best-of-the-best, including many never-before-released shows! 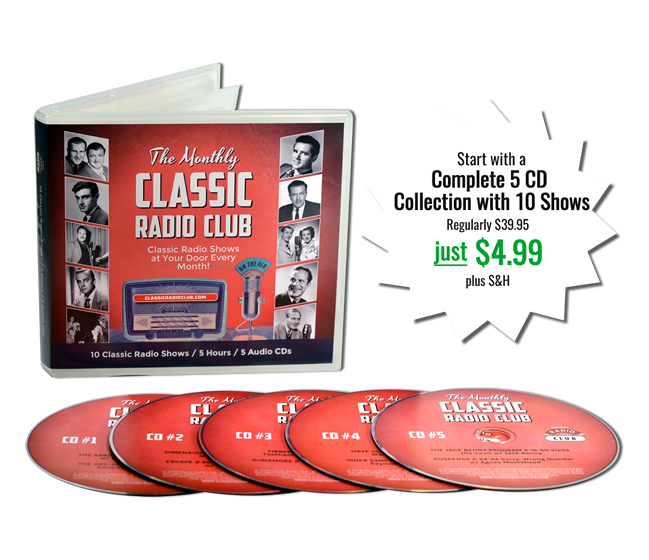 Join now and receive this 5 CD collection featuring 10 classic radio shows for only $4.99 (plus $4.99 S&H). 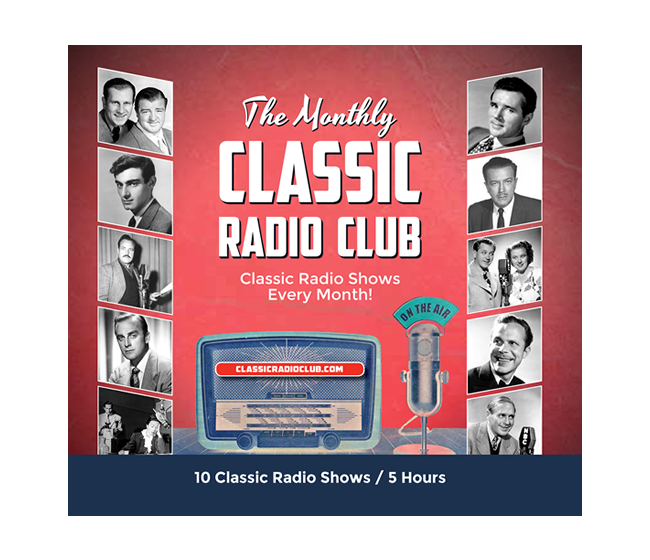 Then each month you’ll receive 10 different classic radio shows for only $14.99 (plus $4.99 S&H). Plus, you’ll receive detailed liner notes and fun facts about each classic radio show! Join now and receive these 10 classic radio shows emailed to you via digital download for only $4.99. Then each month you’ll receive 10 different classic radio shows emailed to you via digital download for only $9.99. If you're a fan of The Golden Age of Radio, then this is the club for you! Now you can receive 10 half-hour, brilliant-sound-quality, classic radio shows every month (plus detailed liner notes about each show). I have spent nearly 40 years licensing 100,000+ master recordings of classic radio shows from the owners and estates in order to bring you the most popular and best-sounding radio shows from the 1930s, 40s and 50s. By joining the Classic Radio Club, I’ll personally select the classic radio shows you’ll receive each month. I’ll choose the best-of-the-best from my library of 100,000+ classic radio master recordings and include never-before-released shows -- some of which have not been heard since they originally aired. I'll choose from: Suspense, Jack Benny, The Shadow, Inner Sanctum, Abbott & Costello, Lights Out, Fibber McGee & Molly, Our Miss Brooks, Gunsmoke, Philip Marlowe, The Great Gildersleeve, Have Gun-Will Travel, Sam Spade, Burns & Allen, The Whistler, Johnny Dollar, Dimension X, The Life of Riley, Escape, Boston Blackie and many, many more with hundreds of stars including Orson Welles, Frank Sinatra, Cary Grant, Lucille Ball, James Stewart, Humphrey Bogart, Jack Benny, Vincent Price, Barbara Stanwyck, Basil Rathbone, Bob Hope, William Conrad, Howard Duff, Robert Young, Jack Webb and many more. And the best part is you can now own the finest sound quality, remastered episodes available anywhere AS ORIGINALLY BROADCAST with the original sponsor commercials. We work with the owners and estates of these Golden Age of Radio shows and they have provided us their master recordings which we then digitally-remaster so your copies are brilliant, superior sound quality. Enjoy The Best of Classic Radio with a New Surprise Line-Up Each Month! 10 half-hour classic radio shows sent to you every month! CD MEMBERSHIP members will receive a 5-CD collection mailed to your home. DIGITAL DOWNLOAD MEMBERSHIP members will receive 10 half-hour classic radio shows emailed to them via digital download every month! CD MEMBERSHIP members pay an introductory rate of $4.99 (plus $4.99 s/h) for the first month and then $14.99 (plus $4.99 s/h) for each month after. DIGITAL DOWNLOAD MEMBERSHIP members pay an introductory rate of $4.99 for the first month and then $9.99 for each month after. You will never be sent a duplicate classic radio show for as long as you are a Club member. You will receive detailed liner notes with historical information and fun facts (sent along with the CDs on the CD MEMBERSHIP and sent via email on PDF along with the digital downloads on the DIGITAL DOWNLOAD MEMBERSHIP). You can cancel at any time and there is no further obligation. so much fun each and every month! Just think how much fun it will be to receive 10 classic radio shows in brilliant sound quality each and every month! And while you’re listening to these gems from radio’s past, you can learn about them too with the historical liner notes and fun facts that I will write and send to you each month. You’ll receive the biggest and best classic radio shows ever broadcast along with rare and exciting shows you may never even knew existed! I’ll make sure that each month you’ll receive the biggest stars from the Golden-Age Radio and Hollywood. And remember, you can cancel at any time if you are not completely satisfied. Sherlock Holmes / Life With Luigi / The Shadow / Lights Out / Charlie McCarthy / Yours Truly, Johnny Dollar / Ozzie & Harriet / Escape / My Favorite Husband / Night Beat / Bold Venture / Black Museum / Fred Allen / Suspense / Amos N’ Andy / Nero Wolfe / Boston Blackie / Lux Radio Theatre / Nick Carter, Master Detective / Jack Benny / Dragnet / The Whistler / This Is Your FBI / The Aldrich Family / Lives of Harry Lime Gang Busters / Green Hornet / Bickersons / Tales of the Texas Rangers / Inner Sanctum / Dimension X / Cavalcade of America / Story of Dr. Kildare / Pat Novak, For Hire / Father Knows Best / Cisco Kid Burns & Allen / Sam Spade / Hopalong Cassidy / Michael Shayne / Screen Director’s Playhouse Duffy’s Tavern / Baby Snooks & Daddy / Hall of Fantasy / Mysterious Traveler / Weird Circle / The Saint / Broadway Is My Beat / Crime Classics / Casey, Crime Photographer / Philip Marlowe / X Minus One / Mr. & Mrs. North / Dr. Christian / The Falcon / Murder At Midnight / Fort Laramie / Rocky Fortune / Mr. President / Halls of Ivy / I Was A Communist for the FBI / Great Gildersleeve / Richard Diamond / You Bet Your Life / Lum & Abner / Mercury Theatre on the Air / Damon Runyon Theatre / Mr. District Attorney / Box Thirteen / My Friend Irma / Our Miss Brooks / Phil Harris & Alice Faye Show / Roy Rogers Show / Six Shooter AND MANY MORE (as we are always licensing additional shows)!